Buffalo Studios has released a sequel to its popular Bingo Rush iOS game, appropriately named Bingo Rush 2. The game is still coming soon to iOS, Android and Kindle Fire devices in the US, but is already available to play on Facebook. 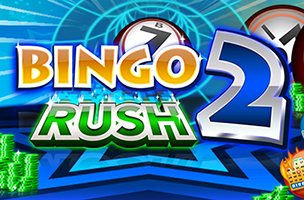 Bingo Rush 2 offers multiple rooms for play in a single player mode, a daily tournament feature and more. Bingo Rush’s main focus is its single player game mode. Players can use tokens to purchase up to eight cards per game, and can control the game at their own pace. That is, the game will only call new numbers when players have correctly daubed all of the currently available numbers. If a number is called but isn’t available on any cards, players can tap on the “next ball” button to rapidly move play along. Meanwhile, the game’s daily tournament mode gives players free cards, and challenges them to earn as many bingos as possible on those cards before time runs out. Scores are compared against friends and strangers on the leaderboard, and gamers can purchase additional cards in each tournament for a chance to earn a higher score. Both gameplay modes offer power-ups, which are available after every few daubs. One may daub non-called numbers, while others add bonus coins to squares or freeze the clock for a few seconds, among others. As players daub numbers, they’ll earn experience points for leveling up and unlocking new rooms for single player gameplay. The game also has menu listings for “Challenge” and “Coin Blaster” gameplay modes, but these will be added in a future update. Bingo Rush 2 is now available to play for free on Facebook. Check back to follow the game’s progress on AppData, our tracking service for mobile and social apps and developers.